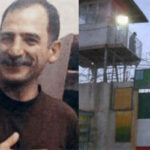 Human Rights Activists News Agency (HRANA) – Political prisoner Saeed Shah Ghaleh, who was convicted of Moharebeh (enmity against God) through cooperation with the People’s Mujahedin of Iran (MEK), enters his 18th year of incarceration in Mahshahr prison, located on the border of the southwestern province of Khuzestan. After Shah Ghaleh’s arrest in 2000, he was initially tried, convicted, and sentenced to death in a criminal court. The death sentence was later commuted to life imprisonment. On April 17, 2015, he was among the group of prisoners assaulted by prison guards in Section 350 of Tehran’s Evin Prison in an attack that came to be known as “Black Thursday.” Following the Black Thursday raid, he was transferred to a solitary confinement cell in Section 240. After spending some time in solitary confinement, he was exiled to Mahshahr Prison (Khuzestan province). Having never been released on furlough, he has remained there to this day. Iran’s Islamic Penal Code was amended in 2013. [According to section 10, subsection B of the new law], those convicted of crimes for which the sentences have been reduced in the new law are eligible to apply to have their sentences reduced. Ghaleh is on a list of 26 prisoners —published by HRANA in 2016 — who are currently serving life sentences for Moharebeh and are now eligible to act on this amendment. Life imprisonment, like the death penalty, is used commonly by Iranian court to punish defendants accused of political or security-related offences. The conditions of prisoners serving life imprisonment are reportedly very poor, and their rights, such as access to medical care, are rarely observed. HRANA News Agency – This morning, one hundred employees of a special project to safeguard construction plans in the region staged a sit in and demonstration in front of the governor’s office in Mahshahr [Khuzestan Province, Iran].